If you need something with a longer reach or that can be permanently fixed, a static grounding reel is the right choice over an assembly. Our line of static bonding and grounding reels are used extensively with aircraft refueling, and the loading/unloading of tank cars, storage tanks, trucks, grain silos, and chemical/fuel refineries. The underside of all our reels are unpainted, so that you can mount the reel directly to a grounded surface, or to the conductive item that you wish to ground. The ML2930 Series are very ruggedly constructed to withstand the toughest environments. Their open-style design seals all the mechanical parts in an internal gasketed chamber. This prevents dirt and moisture on the cable from reaching the mechanical parts inside. A latching mechanism holds the cable at any desired length. A slight pull on the cable releases the mechanism causing retraction. A ball and adjustable cable stop on the cable assembly keep the cable end within easy reach. The standard models include the LE-21C alligator clamp. Our heavy-duty static grounding/bonding reels offer steel components and a cantilever-type frame, which support the reel assembly, and are designed to function under the most adverse conditions. Retraction need not be attended, as the retraction speed is automatically governed by a special brake assembly designed to limit the speed from two to seven feet per second. Maintenance and repairs are made possible by bolt-together construction. Baked-on MIL spec red finish and gasketed drum construction protect operating parts from corrosion. Bearing surfaces are permanently lubricated. 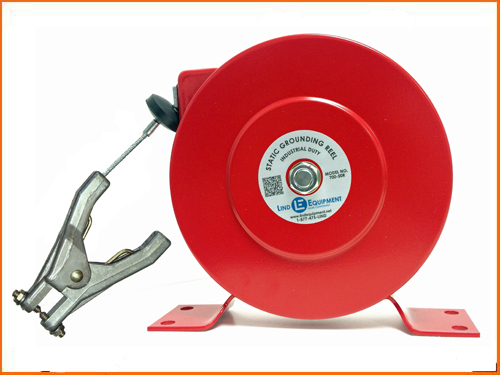 Substitute the LE21C alligator clip for our heavier duty REB clamp when using this reel in outdoor areas or with painted, dirty or rusty surfaces. Add "REB" to the end of the part number. Need a different clamp? Need a specialized wye? We can do customized static ground reels. The Lind Equipment heavy-duty reels offer a robust, gasketed design in a lower cost, riveted construction. Priced very reasonably, providing a viable alternative to manual rewind reels, yet offering the benefit of automatic self-retraction of the cable. Clamps should be walked back to the reel during retraction. These reels meet MIL-PRF A-A-50696 for use in military deployments. Substitute the LE21C alligator clip for our heavier duty REB clamp when using this reel in outdoor areas or with painted, dirty or rusty surfaces. Add "R" to the end of the part number. These ruggedly constructed reels are an economical alternative to automatic retracting reels. In addition to lower initial cost, there are fewer parts to maintain, allowing for years of trouble-free service. ML2930 series hand-wind reels also offer highly compact storage of a wide range of cable lengths up to 150'. 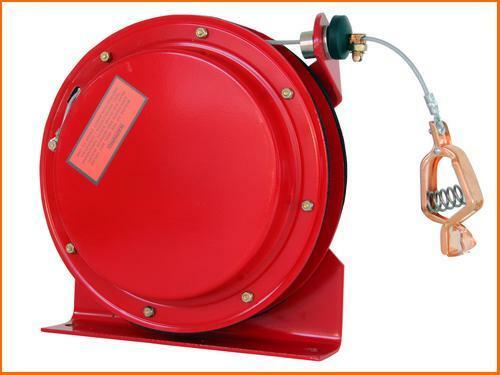 Our industrial static grounding reels are compact and lightweight. Their enclosed design is best suited to indoor installation, and applications where a low-cost reel is needed.